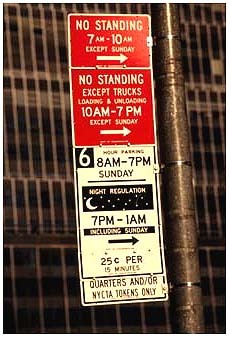 If you find parking confusing in New York City, you’re not alone. Sign posts with multiple conflicting instructions are everywhere, leaving drivers scratching their heads as to which to follow. Councilman Dan Garodnick is proposing a plan to simplify the parking signs, and require the city to re-assess them every three years for clarity. The bill was introduced Thursday, and Garodnick says he hopes to have a hearing before the Transportation Committee as soon as possible.